1.1 Thesis Statement The society currently is manipulated by a group of cross-sector corporate giants who, through holding the reins of mainstay economic sectors that lack competition, effectively control or influence both the Hong Kong market and land, as a result the majority of us are being affected everyday lives. In the absence of any regulatory control over economic and industrial concentration, it is facing polarization gap with the social injustice and the hegemonic situation that is reflected in the urban built form. With the changing roles of people and spaces in the contemporary urban society, neighborhoods are being driven out of the area, districts become commercialized. Street activities can hardly be found within the neighborhood. The life within the district is being singled out by the financial activities during the day and almost nothing at night. Interaction between the public are minimized, with a very limited amount of public space. Public space, as a unique physical space that allows people from different backgrounds to use for free, fulfills various societal needs with its different functions and features. Undoubtedly, it is an indispensable component of our city. Yet, its importance is diminishing in Hong Kong because the high density condition and lack of land led to high land price, which make the public spaces expensive to be provided in many urban areas. Majority of space are used for commercial purposes while the importance of public space is neglected and left as some residual spaces. Although the polarization between the rich and the poor seems to be an inevitable result from the Governmentâ&#x20AC;&#x2122;s laissez-faire policy, I believe equality still can be achieved through a common place that belongs to everyone in this urban context. Where everyone can enjoy equality through good planning and design of a building. From Trafalgar Square to Victoria Park, physical public spaces remind us of its multiple ambitions and capabilities for accommodating consequential political activities as well as everyday leisurely pursuits. The production of public space simultaneously implicates and transcends technical decisions with regard to design, financing and management considerations. Public space is an integral element of a city. Its appearance and functions can very often reflect the life quality of a place at a certain time. The societyâ&#x20AC;&#x2122;s requirements on a public space are primarily based on whether it can satisfy the needs of the general public. Although with high density of people and limited land, we are provided with a small amount of open space per person in the city; within the amount of public space, we can make use of the spaces with higher efficiency to achieve a better quality of urban life. Executive Summary What social issues affect Hong Kong people and their urban environments? Hegemony is defined as authority, control or influence by one dominant group over another. In Hong Kong, land supply is strictly controlled by Government; development is largely controlled by a handful of large developers. Together, Government and developers dictate urban development to maximize their respective profits. The increasing gap between rich and poor is reflected in the increasing gap in urban places that are economically affordable by the majority of people. For example, Central is the urban core of our city but no longer affordable by most except for the highest end of commercial offices and retail, and increasingly at the expense of diversity and neighbourhoods, of people and places. In particular, high land prices and high density developments cause public space to be viewed as prohibitively expensive to provide and maintain. Public space is generally neglected and, when provided, is often residual, leftover space. Intention of this thesis project: Objective of this thesis was to design a project that demonstrates the essential need to integrate more truly accessible public buildings and public spaces within the context of monopolistic urban developments â&#x20AC;&#x201C; urban places and spaces that serve as both public destinations and connectors within the city. dark clouds - hovering over the towers suggest society is currently in a ‘doomsday’ situation, it is monopolized. hawk - symbolic meaning of power and vision, representing the ruling class of Hong Kong high in the sky over the poor. buildings - densely built together in the monopolized urban area which neglects peoples’ need with only profit in mind. layman - at the very bottom of society, where people are lacking essential needs including public needs. pigs - representing the layman’s worthless position in this society. coins - the ultimate substance that everyone is affected by. public space - provided in small, residual spaces and neglected in this urban context. area for making profits. For the general public, these public spaces no longer cater to their public activities nor fulfill their expectations of public spaces. Most of the parks built by the government in the urban area have been scarcely visited and used by most of the people, and the â&#x20AC;&#x2DC;public spacesâ&#x20AC;&#x2122; provided by the private enterprises turn out to be pseudo due to the sake of fulfilling the minimum requirement in the policy and gain maximum benefit. These mismatches of the provision and usage of the public spaces have become a social conflict. Corporations should take up its social responsibility to contribute to the city development and create a better co-operation between the public and the private. Yet, some developers who do take up their responsibilities, those turn out to be more successful projects than the others. Evolution of Public Space in Hong Kong Identifying the evolution of public spaces in Hong Kong gives a clear idea of itsâ&#x20AC;&#x2122; history in public spaces development as well as understanding peoplesâ&#x20AC;&#x2122; options for social interaction platform. Generally speaking, to deal with the rapid population growth and limited land supply, Hong Kong has created a unique utopia of public spaces that is rarely seen in the rest of the world. From streets and urban parks to elevated walkways and podium gardens. This has generated a second layer of public street life in the city to caters the space demand. Metropolitan Environmental Quality Comparison Open spaces are parks, squares and gardens that exist inside a city spaces to play, exercise or enjoy the day. These spaces contribute to the quality of life of the people of a city . Comparing Hong Kongâ&#x20AC;&#x2122;s open space per capita with other metropolitans around the world puts Hong Kong to shame. London has the most open spaces per capita in Europe and the the capital contains 35,000 acres of public parks, public squares and gardens, 40% of its surface area is made up of publicly accessible green space along with public space. Providing 38 square meter per capita. Follows by 26sq.m. for New York, 8sq.m. for Singapore and Shanghai, 5 sq.m. in Tokyo and last with only 2 sq.m. per capita for Hong Kongers. We can not change the fact of the amount of open spaces, but what we can do is to make the space that are provided with a higher efficiency and more publicly integrated with the city. together strangers enables certain kinds of activities which cannot happen, or does not happen as well, in the intimate private realm. In public, people can access unfamiliar knowledge, expanding the horizons of their information. A market depends on these expanding horizons of information. In public, people can discuss and debate with people who may not share the same assumptions or the same interests. We lean towards public spaces that can potentially act as stages for public life, loosely defined as where one can interact with each other, regardless of people they know or they donâ&#x20AC;&#x2122;t know, through supporting social exchanges, entertainment, community organizing (such as protests) and commercial activities, thereby providing benefits to the community. The existence of public life is a prerequisite to the development of public space. A public space without public life is one that loses its soul, resembling a dead human body, which is simply a body without human life. 3.1 Urban Public Space Study Ingredients to Make Great Cities Six categories of public spaces have been set out to identify each citiesâ&#x20AC;&#x2122; most recognizable space for each of the activity. Public Event Space, Popular Tourist Area, Political Demonstration, New Year Celebrations, Sports and Outdoor Concerts, Festival Marketplace. The 6 categories has covered most of the major public interaction that happens in any metropolitans. Looking at how the place is popular to people and what provides that place with the vibrancy. Most of the selected examples are located in the center area of the city, depending on the events that it hosts. Focusing on the very center point of the city, within 1km of the distance , what sort of public spaces are provided in the urban center, and how close is the nearby urban park. In the condensed city of Hong Kong, Victoria Harbor is the center of the city, most of the public spaces from the chosen category are located closely together and near the edge of coast line. Festival Marketplace in Hong Kong, there seems to be yet non-existence of a Festival Marketplace in Hong Kong. Most of the market place are located on streets such as Ladies Market in Mong Kok and Stanley Market in Stanley. West Kowloon reclaimed land currently undergoing a leisure and cultural development. The space is often used as a major outdoor music festival, art exhibition and other rare festivals. It often has runners and cyclers at the promenades when it is not used for events. Tsim Sha Tsui Promenade is a major tourist hub in metropolitan Hong Kong, with many shops and restaurants that cater to tourists. Many of Hong Kongâ&#x20AC;&#x2122;s museums are located in the area. Victoria Harbor and the iconic Hong Kong Skyline at the HK Island are the main attraction for the promenade, often has big celebration events with fireworks at festivals. An urban park located between Tin Hau and Causeway Bay, with much of the sports recreation facilities. Every year it holds large events such as Lunar New Year Fair and some art and culture exhibitions. It often used as a gathering point for demonstrations, with weekly City Forum held in the park.
? A major shopping center and office tower complex with privately owned public space (POPS) at ground level. It has become one of the two main gathering point for new year celebration. Various activities take place which become an attraction to commerces for business. However the generous set back becomes an important breathing space in the dense urban condition. Main sports venue of Hong Kong all take place at this stadium, it somehow represents Hong Kongâ&#x20AC;&#x2122;s sports with a symbolic meaning. The stadium was supposed to be a multi purpose entertainment and sports venue. However, its open-air nature has led to noise complaints from residents in tower blocks surrounding the stadium. Hong Kong has many street markets or shopping complex dotted around the city, yet there are no public activates happening apart from commercial activities. 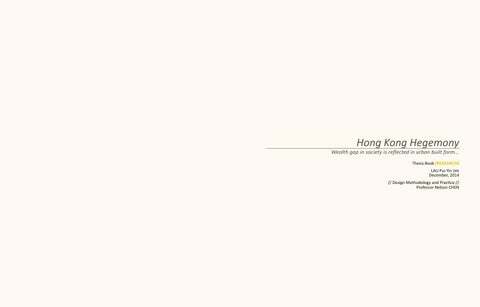 The two are always separated with very minimal relation as shown in Hong Kong; especially in the densely populated urban area. In the past due to the restrictions on freedom of association and of speech. Therefore there are no famous or wellknown areas for political gatherings. However, the People’s Park would easily be the venue for political demonstration activities, with the surrounding Governmental Amenities and open spaces provided. Although the park was built for the expo exhibition, the space is now became an area for tourists, and host events such as music festivals and exhibition. Visitors can walk along the riverside and enjoy the landscaping combines Western and Chinese gardening styles. An affluent car free shopping, eating, entertainment district reconstituted traditional stone gate houses on narrow alleys. Tourist are attracted by the active nightlife on weekdays as well as weekends though romantic setting. The park’s central location makes it the main spot for rallies and demonstrations in Shanghai where the Governments head quarters are located. With several major museums and Shanghai’s main shopping street nearby, it is also one of the top tourist destinations in the city. This is one of the most famous tourist destinations as well as an iconic place for Shanghai. The promenade allows the capture the skyline of Shanghai with the former Shanghai International Settlement as backdrop. Light show and fire works gathers people around the world on New Yearsâ&#x20AC;&#x2122; Eve for a festive celebration. Used as a multi purpose stadium where currently the Home ground for Shanghai East Asia football club. Being one of the largest football stadium in the world, it has held many sport events opening ceremony as well as other cultural events such as music concerts. Associated with the former fruit and vegetable market in the central square, now a popular shopping and tourist site, and the Royal Opera House. Attractions driven by the central square with its street performers, theaters and entertainment facilities, including the Theatre Royal, Drury Lane, and the London Transport Museum. Manhattan has a very different approach to the other cities in terms of the urban planning, all the famous public areas are spread out, therefore the main urban park is distanced from the urban center. The public spaces are closely related to the Avenues rather than on the coast line like other cities. Being the largest open space in New York City, it allows many recreation activates such as cycling, roller skate and seasonal activities. Music festivals are available to be held in the large open spaces on special dates while picnic / relaxation activities happens throughout the year on different seasons. A commercial complex but also a hot spot for tourist. Itâ&#x20AC;&#x2122;s planning allows to draw people into the heart of the complex with seasonal events and other public elements. Being a National Historic Landmark helps to draw tourist to the area but also create a symbolic meaning to the people of the city. The park has historically been the start or the end point for many political demonstrations, now became primary public gathering point for mourners. Greenmarket is held regularly on weekdays by a number of regional farmers, serving more than 250,000 customers per week. This is a popular meeting place, given its central location in Manhattan and its many nearby subway routes with many bars and restaurants. Commercial intersection that is one of the world’s most visited tourist attractions, brightly adorned with billboards and advertisements along with various events and street performances. Annual New Year’s Eve celebrations attracts millions of people gather for the count down as a year round attraction. Home ballpark for the New York Yankees and the New York City Football Club. This has a strong symbolic meaning to the New Yorkers as a home for their team. A museum displays Yankees’ memorabilia along with wide choice of restaurants, it becomes a place to gather the fans from around the world. The capacity is large enough to allows music concerts to be held in this stadium. It has a strong historic background, the original fish market has became a commercial area. With modern tourist malls featuring restaurants, shopping and nightlife, it attracts many tourists. Revitalization strategy of modern shopping areas has turned the museum int0 a greater tourist attraction. London is known the world over as a leading financial centre, but its parks, woodlands and gardens play a key role in making it perhaps the best place to live, work and visit in the world. The public open spaces are closely linked together along the river and the urban parks. In addition, London’s parks and woodlands plays a major part for tourism and a boost to the local economy. Being the largest park in London, it has held many major events in the past including the Great Exhibition of 1851. It has become a traditional location for mass demonstrations, with the Speakerâ&#x20AC;&#x2122;s Corner which holds political debates form time to time. It has also been the venue for some famous rock concerts and seasonal events for entertainment purposes. This is the well known tourist attraction in the central London. Contemporary art installation has been hosted along with other commemorative statues and sculptures. The square is also used for political demonstrations and community gatherings, such as the celebration of New Yearâ&#x20AC;&#x2122;s Eve. An island with open green area is another main tourist attractions which contains ten statues of statesmen and other notable individuals. It is also the place where many demonstrations and protests have been held. The promenade shows the iconic side of London, with the surrounding landmarks. For that reason, it easily becomes the detestation for festival celebration. Events include arts, music and community festivals happens annually to promote the cultural and tourism industry. New Years Celebration with fireworks happens at the river every year which becomes the spot for the festival. Being the association football stadium, it hosts most of the major football matches and other sport matches. A sliding roof allows it to hold many other events, particularly major concerts but also private events like weddings and conferences. In the scale of building complex study, both overseas and local examples will be studied and compared. This study seeks the ingredients on how a complex and a building itself integrates with the city to become a public space. Comparing Rockefeller Center in New York and Times Square Shopping Complex for their similarity on locations and program, different approaches on public area dedication and strategy shows a significant comparison between the two. Other studies in urban complex such as the transformation of Quincy Market in Boston and a redevelopment of Liverpool One would provide a great deal of strategies and ingredients in making building complex a seamless integration to the city. Rockefeller Center should be read as five ideologically separate projects that coexist at the same location. Ascent through its five layers exposes an archaeology of architectural philosophies. Aerial View of Rockefeller Complex N.T.S. Rockefeller Center is the most mature demonstration of Manhattanismâ&#x20AC;&#x2122;s unspoken theory of the simultaneous existence of different programs on a single site, connected only by the common data of elevators, service cores, columns and external envelope. Three blocks stretches across the Fifth Avenue and the Sixth Avenue, between 48th St. and 50th St.. Covering 5 hectares of land in the original complex plan. The introduction of Rockefeller Plaza to break the block into a smaller lot; following the Manhattan Grid, pedestrian promenade leads people into the plaza, creating a city within a city. Complex expands and claims more frontage on the Sixth Avenue. Designated more areas to the public to create public plazas. Underground network has connected the entire complex, with commercial activities and subway connectivity. 9. SUNKEN PLAZA This was developed from searching the answer of how to attract shoppers down to this underground concourse. Later, fountains and tress were placed in the plaza as features. Seasonal events, such as Ice Skating and Christmas celebrations take place as attractions. The plaza became the destination, the heart and main focal point of the complex. UNDERGROUND SHOPPING CONCOURSE The Concourse establishes an underground pedestrian passages between buildings from 5th to 6th st and 47th to 53rd. There are 6 subway access along concourse, filled with a series of shop and restaurants. Later the shops were surviving without the help of the plaza, increasing popularity of Radio City was bringing the numbers into the area and the plaza. 8. RADIO CITY MUSIC HALL Completed in 1932, at the time it was promoted as the largest and most opulent theater in the world. It plays a major in the complex as a destination, it is one of the most popular tourist attractions, the Music Hall has been attended by more than 300 million people. 12. ROOF GARDENS Developing gardens on the roofs was a central element of Raymond Hoodâ&#x20AC;&#x2122;s ideal city. In result, creating the third layer in the city. Also with the spread of roof garden from block to block, the effect of open space among the great towers is created. 5. CHANNEL GARDEN The channel created by the English and French building has draw people into the complex from the Fifth Avenue. The circulation arteries become a destination itself, with the use of vegetation, sculptures and stores, sloped steeply down to meet the plaza steps. Created a natural gateway to the plaza. Times Square was built in 1994 as a major shopping mall redeveloped from a former tramway depot. Only 60 percent of the site is built upon, which creates a welcome open space in a highly congested area in Causeway Bay. This open space is used for civic activities, exhibitions , performance and it is one of the designated locations for the new year count down. Aerial View of Times Square Complex N.T.S. The MTR Causeway Bay South concourse and its auxiliary spaces in the fifth basement floor links Times Square to the existing MTR Causeway Bay through the tunnels underneath Percival Street. Pedestrian Corridor intersect with Existing Street Patten Pedestrian corridor is introduced to allow the open piazza to connect from different entry point. Designated Public Space Public Space act as a node of pedestrian network. Set back becomes an important breathing space. Subway connection is linked with underground commercial activities and lead to open piazza. OFFICE TOWER 194 meters with 33 storeys high towers facing North gain maximum of day light. This skyscraper is one of the tallest building in the area and stand out as a Landmark. 2. OPEN PIAZZA 40 percent of the plot area was devoted to the public as a open piazza. This allow pedestrian activities and serve as an open space for civic activities, exhibitions , performance. Because of the location it is one of the designated locations for new year count down. RETAIL PODIUM 14 storeys of retail becomes the main attraction of Causeway Bay as a popular shopping district. Filled with restaurants, shops and entertainment facilities. 3. PEDESTRIAN CORRIDOR Introducing the pedestrian corridor connecting the back to the front of the complex makes the area fully pedestrianized. This help the ease of human traffic on grade and makes the entire ground floor easier to access. Overall view of Times Square N.T.S. OPEN PIAZZA Freed up the ground floor as a pedestrianized street for the public open 24 hours. Generous set back becomes an important breathing space to the district as well as a node. Faneuil Hall Marketplace, which involved a 1976 renewal by Benjamin Thompson & Associates in Boston that signaled the rebirth of a beloved but then-decrepit historic landmark, transformation of Boston’s historic Quincy Market buildings into Faneuil Hall Marketplace in 1978 was a six-acre sustainable reuse and redesign project of Boston’s first public market. Aerial View of Faneuil Hall Marketplace N.T.S. Faneuil Hall Marketplace fulfills the requirements of a design continuing to satisfy its original function into the present and continues to be a vibrant presence in Boston’s downtown. Orginal Market Complex Faneuil Hall was served as fishing market before 1830, then it served as supermarket, business exchange and town meeting site at the coastline. Expansion of Market Complex Downtown commercial demand had grown beyond the capacity of Faneuil Hall. To provide an expansion of shop space Quincy Market was built, as an indoor pavilion of vendor stalls; so has the coastline of Boston. Introduction of Festival Marketplace By the early 1970s, Quincy Market was decaying. Developer Rouse Company developed a new building form, the festival marketplace. Indoor and outdoor space both served as food and retail area. Combining the main market, becoming The new Faneuil Hall Marketplace. Boston Street Pattern with Pedestrianised Area The development of festival marketplace, streets are pedestrianised allowing activities to happen indoor as well as outdoor. 2. FANEUIL HALL It has been a marketplace and a meeting hall since 1742, now it is part of Boston National Historical Park and a wellknown stop on the Freedom Trail. It has became the 4th most visited tourist site in America because the history and present marketplace innervation. Overall view of Feneuil Hall Marketplace N.T.S. 3. QUINCY MARKET Quincy Market is a historic market complex which behind of Faneuil Hall. It was an expansion of shop space as an indoor pavilion of vendor stalls. The main Quincy Market building continues to be a source of food for Bostonians, though it has changed from grocery to foodstall, fast-food, and restaurants. It is a popular and busy lunchtime spot for downtown workers. In the center, surrounding the dome, is a two-story seating area. 1. MARKET SQUARE The market square contains Sam Adams Statue, it represents the Revolutionary patriot. This area act as a entry to the Faeuil marketplace, with facilities allow public to rest. The open spaces at both the east and west ends of the marketplace are a common venue for various street performers, as well as street vendors. Most daytime visits to Quincy Market will encounter a large circular crowd of people standing around a juggler or other act. 7. OUTDOOR SHOPPING AND DINING Further street vending space is available against the outside walls of the building, especially on the south side, under a glass enclosure. Most stalls in this space sell trinkets, gifts, and other curiosities. A few restaurants also occupy fully enclosed spaces at the ends of this enclosure. Aerial Liverpool One Complex N.T.S. Liverpool One is a shopping, residential and leisure complex. It is a retail led development, anchored by department stores Debenhams and John Lewis, with additional elements including leisure facilities, apartments, offices, public open space and transport improvements. The completion of Liverpool One has significantly boosted the local economy as well as lifted Liverpool into the top five most popular retail destinations in the UK. The scheme creates new â&#x20AC;&#x2DC;high streetsâ&#x20AC;&#x2122; within the city centre, with the Paradise Street area transformed into a pedestrian zone. Car parking and a manned cycle park underneath. An initial concern at the planning stages was that additional parking spaces would lead to an unacceptable traffic increase. However, evidence showed that the main effect would be to make existing shoppers stay longer. Redevelopment Area 17 hectares of land are listed into the redevelopment scheme for Liverpool One, as a new center of Liverpool. Chavasse park is an open space in the city centre of Liverpool, the park was extensively altered as part of the Paradise Project redevelopment scheme. It is now reinstated atop a new 2000-space underground car park. The influences acting on Grosvenorâ&#x20AC;&#x2122;s central Liverpool development, the border of which is outlined in red. The development has come to act as a hub, stitching the city back together and linking its different districts. 1. ONE PARK WEST CĂŠsar Pelli has designed this 17-storey building in central Liverpool, consisting of 326 apartments, offices, restaurants, cafĂŠs and parking. Located at the border of the redevelopment, creating a iconic image for the entire development project and it is the tallest building in the development. 2. HILTON HOTEL One of the landmark building that is framing the entrance and the boundary of Chavasse Park. Providing the one of the two hospitality of Liverpool One . Catering the existing business sectors in Liverpool. 4. DEPARTMENT STORES Anchor stores re required to provide quality assurance, big brands and the range of products that will attract people to the development without them, no development will be viable. Three department stores are located at different corners of the district. 3. CHAVASSE PARK Chavasse park is an open space in the city centre of Liverpool, the park itself was extensively altered as part of the Paradise Project redevelopment scheme. It is reinstated in rising terraces on top of 3,000 car park spaces and dominated by the residential development at the surrounding area. Framed by city centre buildings. Overall view of Central Market N.T.S. 5. TRANSPORTATION HUB Bus station and a multi-storey car park at the edge of the main shopping district are one of the strategy for attracting people at the suburb area and is a way to allurement consumers from outer fringes to shop in the city centre. they both have similarity on the way properties are located closely together and interconnected with each other. This allows the ease of accessibility between the complexes. The interconnection between buildings creates a second layer of streets above ground; this way, public have the accessibility to all buildings without being on ground avoiding on grade traffic. Podium, plaza and pedestrianized streets are also designated to the public with activities within the developments; it becomes the icon for the urban context. Benefits are also given to the developers in this way; the connection allows their properties to become a city within a city or sometimes the important connector in the city. The value and the flow of pedestrian of these properties will rise simultaneously. This gives an idea how profit and public facilities provision can coexist with each other in urban context. Swire Properties’ vision of building TaiKoo Place into a premium business and retail community was unique in Hong Kong. It all began when the Taikoo Dockyard was redeveloped into what is now Taikoo Shing, one of the first, and most distinctive, private residential developments in Hong Kong. Today, TaiKoo Place has become a vibrant locale for thriving businesses and diversified entertainment. TaiKoo Place, one of Hong Kong’s best planned and most efficiently serviced business districts, is a dynamic retail and office centre comprising commercial spaces, shopping mall and hotel accommodation. With a cosmopolitan atmosphere of public spaces, restaurants, cafés, hotel accommodation and extensive shopping facilities, this has become a high energy neighborhood for both business and pleasure. Street Pattern with Pedestrianised Area Streets being pedestriansed generally gives the community a higher quality of public space and stronger connections within the neighborhood. Vehicles only operates on the outer surface of the community, this would increase the activities on grade. Civic plaza has been created to serve the office workers and the residence. Create public realm in the intersection between the two to give that tradition. Pedestriansed street also designated to the public for various events. In Taikoo Place, all of the office building are interconnected to each other at the concourse level to create a second layer of pedestrian network. The circulation network stops in the heart of Taikoo arriving at the civic plaza. BRIDGE LINK SYSTEM TaiKoo Place has continuously promoted art by offering complimentary exhibition venue for artists to display their creativity. Provision of free venue and necessary administrative support has proved beneficial, especially to individual artists with small budgets, to reach out to the public. The linkage benefits the community for the ease of access to the MTR system at a elevated network, avoid ground level pedestrian traffic where heavy vehicles often operates during the office hours. Overall view of TaiKoo Place N.T.S. 12. VIA FIORI The four hectare plaza exemplifies the design objective of elegant simplicity for the thirty thousand office users and adjacent residents. 230 meter long promenade to the plaza and culminates at the tower’s podium base. TONG CHONG STREET Pedestrianized Street where outdoor events happens, from Farmer’s Market to Christmas Celebration at weekends and Festivals. The street becomes vibrant and festive, serve as a magnet during the office off hours. Exchange Square is a major development that sets the benchmark in Hong Kong for a prestigious, globally oriented, 24-hour business complex. It is home to many leading international investment banks and financial institutions. The complex is linked via Hongkong Landâ&#x20AC;&#x2122;s unique pedestrian bridge network to virtually all major buildings in Central. It also provides access to the Star Ferry, the Mass Transit Railway and the Central bus station, located immediately beneath the development. The Forum redevelopment, including the plaza area, is the latest development added to Hong Kong Lands portfolio. The plaza allows public connection to International Financial Centre and to the waterfront of Central. It act as an important bridge link in the Central Elevated Walkway. Hong Kong Lands Properties in Central N.T.S. Hong Kong Landsâ&#x20AC;&#x2122; Properties Streets being pedestriansed generally gives the community a higher quality of public space and stronger connections within the neighborhood. Vehicles only operates on the outer surface of the community, this would increase the activities on grade. 6. BUS TERMINUS The Central (Exchange Square) Bus Terminus is a major bus terminus located in Central, Central and Western District, Hong Kong. Situated on the ground floor of the Exchange Square commercial complex, the terminus is regarded as the central hub of bus routes in the Central District. With a total of 14 berths for franchised buses, it is now the largest bus station in Hong Kong which still functions as a bus terminus, in terms of the number of boarding platforms. 3. EXCHANGE SQUARE 3 The 32-storey office tower came right after the other two, locate on the other end of the garden podium. Three Exchange Square is linked via Hongkong Land’s unique pedestrian bridge network to virtually all major buildings in Central. It has the same superlative workmanship and state-of-the-art communications, infrastructure and services as One & Two Exchange Square. Overall view of Hong Kong Lands Properties N.T.S. 1, 2. EXCHANGE SQUARE 1 AND 2 The Exchange Square complex, consisting of two 52-storey office towers, is located in the Central Business District of Hong Kong at Hong Kong’s harbour line. Built above a public bus terminal which extends over the whole ground floor, the project also incorporates the Hong Kong Stock Exchange. 4. THE FORUM The Forum redevelopment is a holistic design integrating the new office building with it surrounding and thereby revitalising the entire Exchange Square development. The new addition visually and physically opens up the site and creates a new element which is comfortable within its surroundings. Its form gently leanback and opens up from the plaza to a grand double height lobby space and covered walkway. neighborhood. The life within the district are being singled out by the financial activities during the day and left with almost nothing at night. Interaction between the public are minimized, with a very limited amount of public space. This area has the right ingredients to answer and use as a demonstration for the essential need of public space in the center of Hong Kong. Central Market and Statue Square both have a long history to Hong Kong but also lost itâ&#x20AC;&#x2122;s original purpose. Through this project, it becomes an opportunity to redevelop the area to create a public building that could retrieve the original identity. At the same time, creating a central oasis to provide the community with a different purpose other than the dominant financial activities within the area. Central Market was a fresh food market in Central, Hong Kong. Located between Jubilee Street, Queen Victoria Street, Queenâ&#x20AC;&#x2122;s Road Central and Des Voeux Road Central, it was the first wet market in Hong Kong. It is one of two existing Bauhaus market buildings in Hong Kong, being the forth generation of the market. It is now abandoned with few stores by a renovated pedestrian corridor inside, Central Escalator Link Alley Shopping Arcade. Aerial View of Central Market Complex N.T.S. It is surrounded by car roads at all sides of the plot, making it an island site. Tram Rail line is located at the North of the site, on Des Voeux Road Central. The Market used up the entire plot providing nearly 4,ooo m2 of market area. Market serve as a public space itself, providing the area a social interaction venue. Elevated Walkway It became part of the Central elevated walkway, connecting the pedestrian from Mid - Levels to the Central promenade. Connecting nearly half of the Central District which covers 40 hectares of land. 3. ELEVATED WALKWAY The building is largely abandoned with few stores by a renovated pedestrian corridor inside, Central Escalator Link Alley Shopping Arcade. The corridor is linked by two footbridges to Hang Seng Bank New Headquarters Building and Central Elevated Walkway, and another footbridge to the Central-Mid-Levels escalator. Shops in the arcade include tailors, 7-Eleven, cleanser, collectors and other trades. On Sunday, one side of the corridor is a popular gathering place among Filipino domestic workers. 2. ATRIUM Introducing the pedestrian corridor connecting the back to the front of the complex makes the area fully pedestrianized. This help the ease of human traffic on grade and makes the entire ground floor easier to access. 4. TRAM RAIL LINE The tram rail service go pass Central Market on Des Voeux Road Central, from Kennedy Town to Shau Kei Wan, connecting the entire Hong Kong Island form East to West. This served as a public pedestrian square in Central. Built entirely on reclaimed land at the end of the 19th century, Statue Square was redesigned in 1965 in an effort to generate new spatial and visual connections between the Square, the recently reconstructed Queen’s Pier, and the new City hall. The new plan was also part of a city-wide movement to provide more green space for Hong Kong’s fast growing populace. A pedestrian bridge built under Connaught Road along the historical axis of the Square ensured the site’s continued connection to the waterfront. Although the Square has no longer a significant component of the circulation route it once was due to the demolition of the Queen’s Pier, it is supposed to be reconnected to the waterfront when the new Central Reclamation Park is eventually completed. Public pedestrian square in Central dated back from the 19th Century. It was located at the edge of central until the reclamation goes on, later a car park was built in front of the square to serve the Star Ferry Pier. Chater Road is now became a pedestrian road on Sundays and public holidays to server the demand of domestic helpers gathering. With the public space at the ground floor of HSBC, the area is pedestrianized as popular public gathering space. Elevated pedestrian connection serve from Mid- Levels to the edge of central waterfront, it also connects the majority of commercial area and offices. The site is closely located at the edge of the elevated walkway. Underground Connecting Concourse Underground connection with the MTR service is spread across underneath the site, the connection links from Central to HK station. Star Ferry underground connection serving the crossing link of Connaught Road Central. 1. STATUE SQUARE The square is flanked by several landmark buildings. It is an empty space in the heart of a city which, squeezed as it is between mountain and sea, has always valued developable land as the ultimate source of wealth and revenue. 2. THE CENOTAPH The erection of a Cenotaph on a lawn just in front of the Hong Kong Club. And the modification in the lay-out was the disappearance of a wide alley which crossed Chater Road at right angle right in the centre of the Square and which provided the focal point where the monument to Queen Victoria once proudly stood. 3. STAR FERRY CAR PARK The two storey car park lies in the end of the axis of HSBC and Statue Square. This was built to serve the Star Ferry Pier back in the 70â&#x20AC;&#x2122;s. Since the removal of the pier in 2006, the car park still reminds untouched. Small minibus and taxi stops are also located at the end and next the Edinburgh Plaza. 4. STAR FERRY UNDERGROUND CONNECTION This underground subway connects the two end of Connaught Road of Central together. The excess space on top of the subway is filled with a Jokey club betting branch. 5.1 Occupy Central A century ago, Statue Square was the centre of Central. After many transformations of the area, it has become at the edge of Central. It is situated at the most premium land that is worth billions of dollars, yet it is remained as open space for the public with almost no activities expect the weekend. People see this as the holy ground for the historic purpose, but the context has evolved so much that the historic meaning has been lost through urban development. It is time to give this place a new identity as the “centre” of Central to reactive Statue Square’s original purpose and meaning. Occupy Central with a new urban experience but also an extra space for the citizens of Hong Kong. Transformation of Statue Square Statue Square was created in 1897 on land initially reclaimed by the city in the early 1890s. The square’s name derives from the fact that it originally contained the statue of Queen Victoria. Eventually it was removed by the Japanese in World War II. The Statue Square was only designated once the Supreme Court was competed in 1910 and had traditional ingredients of a city square: a central focal point, statues of national icons, green spaces, and a lining of prestigious buildings. Statue Square was redesigned in 1965 in a effort to generate new spatial and visual connections between the Square, the recently reconstructed Queen’s Pier, and the new City Hall. The new plan was also part of a city wide movement to provide more green space for Hong Kong’s fast growing populace. A pedestrian bridge built under Connaught Road along the historical axis of the Square ensured the site’s continued connection to the waterfront, while a series of level changes and collection of asymmetrically placed rectangular pools and planting beds created interesting formal tension both with the site’s original curvilinearity as well as the new City Hall. New spatial enclosures without obstructing pubic mobility in and through the site. Although the Square is no longer a significant component of circulation route it once was due to the demolition of the Queen’s Pier in 2006, it is supposed to be reconnected to the waterfront when the new Central Reclamation Park is eventually completed. Statue Square was built on complete land reclamation, it was built on the edge of the coast 1890 connecting the waterfront and later with Queen’s Pier in 1950. After the removal of Queen’s Pier and further land reclamation projects, Statue Square has lost it’s purpose as a connection route of the city and water, it becomes neglected in the city. Public transportations are densely located on Connaught Road and Des Voeux Road, creating a busy vehicle road network to within the site area. MTR underground system locate right below the site and provides many of the exits at Chater Road, this suggests a possible pedestrianized zone for this area and Statue Square and the underground system connecting the site together under Connaught Road. Jimmy is a white collars who works in IFC Central, only has not been to Statue Square a few times. Today he was waiting for someone to attend a meeting after lunch. “ I am quite surprised there are so few people around,” he answered when I asked for his opinion to the environment. Statue Square is only a meeting point or sometimes a lunch spot depending on the weather. In Central, he mostly hangs out at Lan Kwai Fong with his friends after work or during weekend to social. For food and shopping, he prefers staying indoor near IFC and Exchange Square where air conditioning is provided. But his most favorite destination is the waterfront promenade where he often goes with his friends or colleagues to hang out for cigarettes. “The waterfront is much comfortable than the lousy center,” he commented. Ada is a student who was enjoying her day off, meeting her friend in Statue Square to go round in Central. Unlike the shopping malls or the waterfront, they see it as an destination rather than a transit point. It is well known that Central is often busy and vibrant filled with domestic workers. They make use of the public spaces in parks, squares and garden that allow them to congregates with friends. Statue Square is the first destination for Roxana every Sunday, she gather and hangs out here with her friends after a regular routine at the St John’s Cathedral. Other destinations such as Chater Garden and the waterfront, also prime areas for them to gather and hang out. â&#x20AC;&#x153;Although this is a nice place, it is missing something ...â&#x20AC;? Central being one of the financial hub in the world, but also features a long history of Hong Kong. It attracts many tourists to the place for the numbers of interesting attractions. Peter from Belgium who comes to Statue Square for his lunch break during middle of his sightseeing route. He commented although the place has a nice environment, it is lacking something that make this a vibrant place. Peter is drawn to Central for the history and the modern of Hong Kong. Many of the buildings around Statue Square become the destinations for tourists like Peter. Urban Strategies To activate the long neglected area of Central, it is important to increase the connectives between areas, using the site as an connector for the surrounding open public space to create a macro scale of public space in Central. Allow high permeability through the site, with the maximum of accessibility on grade. Create destinations in each of the sites as a magnet to draw the flow of the pedestrians. Allow the new linkage and connection between city and the waterfront through three horizontal layers of connections, underground, on grade and bridge link. A gradual increase of built form to demonstrate the urban experience of different public space form open softscape to enclose hardscape. public, but if everyone is carrying out individual activity with no interaction between one and another, they are all just living in their own world. As such, a public space needs to possess high level of sociability in order to be deemed successful, because social interactions are the best demonstration of public life. To summarize, an ideal public space should not lack any of these four qualities. Nevertheless, this is a step-by-step process; it must first possess the first quality in order to obtain the second, and so on. 6.2 Justice For All Looking at the judicial system in Hong Kong, it has a close relationship with the aim of my thesis project. It serve as an importance of the society, responses to the need of the society to maintain the vital role. Treat everyone equally and provide legal aid to those who is in need. Nowadays its not easy to bring matters to court without a long procedures. Therefore, the importance of linking the society to the Hong Kong judicial system is vital and not neglect but locate in the heart of the city, bring justice closer to the people. Judicial system has a complex circulation with security and privacy, understanding the movement and access in the between programs are essential. Required programs of judicial system with additional public facilities that allow to provide an equal ground for its people. I regard Court House as a complex and contradictory program, it needs high privacy for the judges’ chambers and security for the legal spaces, on the other hand, it is also open for public to participate. Two separate circulations need to be provided in the complex in order to avoid any disturbs for the judges and staff. Public are allows to enter the observation space to participates the court hearings. Plazas and soft landscape would provide the community an extra space for free intervention of public interactions, provoke the freedom of speech. To integrate judicial system with the community, commercial activities would fit well to serve and caters the visitors but also create new designations in the area to draw the flow of people. The combinations of judicial program and public amenities would bring justice closer to the society, but also provide an extra space for the city of Hong Kong. Civic Concourse serve as an idea of a large open space for accommodating crowds but within a building. It would serve the place as a connector and linkage between the city and waterfront but also accommodates the public interactions in varies point of the building. Publicness is essential for this complex, to allow free access through out the clock to provide the true connector of the city. Between controlled hardscape and softscape to suggest different activities throughout the complex, creating a new urban experience for the city and the public. Offering a new urban experience, proposing a unique space that transcends traditional court house. An interior urban street with an extra space for the city of Hong Kong. 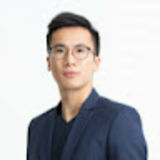 The concept of new civic concourse as an opportunity to create a linked connection not only between city of the harbor but people and the core value of Hong Kong through public realms. This is also a meeting place of major social significance, the complex should be generous, adaptable and multi functional. Its not about designing a court house, its about designing a new utopia of urban experience for the citizen of Hong Kong. The respect the original historic axis, vistas and connections of the context, a gradual increase of built form to demonstrate the urban experience of different public space from open softscape to enclose hardscape. Bridging over and under several traffic segregations to provide the connectivity through out the site. Hong Kong Wealth Gap Statistics According to HKSAR Government statistics, 20 percent of Hong Kongers are living below the poverty line and 50 percent of the population earns less than $14K / month. While 77.5 percent of the cityâ&#x20AC;&#x2122;s assets are controlled by the wealthiest 10 percent of its people. This shows how much authority, control or influence by one dominant group over another. In 2000, 65.6% of the itâ&#x20AC;&#x2122;s assets were controlled by the wealthiest 10% of its people. In 2007, the figure was 69.3% and this year it is 77.5%, making the concentration among the highest the world and the growth among the fastest. When this figure of control is so high, the society should show reflection the imbalance of wealth distribution through both physical and mental elements. Hong Kong Private Residential Market Percentage HKSAR Government and others With the small amount of 30 percent of Hong Kong’s private residential developments, the Government is the major player in this group along with other small private developers. Such low figure shows how monopolized the city’s private residential market is by the 5 major developers. Wharf $7 Billion The company also holds many properties in the Tsim Sha Tsui area of Kowloon, including the flagship commercial property in the Harbour City and Times Square shopping centres in Hong Kong island. Although the focus of the company is in commercial sector, 5 percent of private residential of Hong Kong comes from Mr. Peter Woo and the family. Cheung Kong $32.2 Billion One of the world’s great empire builders Li Ka-shing oversees a far-reaching conglomerate with 270,000 employees in 52 countries. Cheung Kong owns one forth of the entire private properties development of Hong Kong. Cheung Kong also has the largest shares out of the major 5 developers of Hong Kong. New World Development $15.5 Billion Although Mr. Cheng Yu-Tung has the bulk of his wealth lies in Chow Tai Fook Jewellery Group, still providing 11% of private residential for Hong Kong; top 4 of the private developers. 70% Henderson Land $20 Billion 15 percent of the private residential market is controlled by Lee Shau Kee which puts Henderson Land Development the second largest developer in Hong Kong. Financial properties investment has a great assets on the company’s profit making. Sun Hung Kai Properties $17.5 Billion It specializes in premium-quality residential and commercial projects for sale and investment. It employs more than 37,000 people and has in-house expertise in land acquisition, architecture, construction, engineering and property management. Providing 13% of the private residential for the citizens of Hong Kong making them the third largest developer in Hong Kong. 5 different counties have been compared to Hong Kong in terms of their Billionaire Net Worth as Percent of Gross Domestic Product. The greater the percentage is, the greater gap between rich and poor. Two aspects of data needs to be look at to make some conclusion. Data on the people between the rich and the poor such as the population of the nation, total number of billionaires, the percentage of people living under poverty line, the other aspect is the economic side, data such as the gross domestic product and the total net worth of billionaires. Billionaires Total Net Worth: $210 Billion The sum of 45 Billionaires in Hong Kong has the total of $210 Billion of wealth. This is the highest ratio of billionaires to net worth of billionaires between the six countries. Gross Domestic Product : $280 Billion Economic performance of Hong Kong is the lowest out of all, showing Hong Kong isnâ&#x20AC;&#x2122;t much of a competitor to other countries in the world. Billionaires Net Worth as Percent of GDP : 75% The billionaires total net worth of $210 billion, terrifyingly equals 75% of the entire Hong Kongâ&#x20AC;&#x2122;s GDP. This shows the rich in Hong Kong has great power over the economic system, with a great distance between the rich and the poor. The society is being monopolized by groups of corporate giants. Living Under Poverty Line : 20% 20 percent of people are living under poverty in Hong Kong. Although Singapore has a higher percentage, the case in Hong Kong is much more alarming compare to other metropolitans. Number of Billionaires : 45 Within the 7 million of people, a great number of billionaires lives among us. 45 out of 7 million is the highest ratio between the 6 countries. Together, it will show the quality of life the people are living under. How influential and powerful the rich are to the society, and how close the rich and the poor are. Population : 7 Million Hong Kong is clearly one of the places that has the less people after Singapore due to the size of the country. With the frightening 7 million people living in only one thousand kilometer of area. Area of space is decreasing, where are our spaces gone?